Learn how to use Siri Shortcuts with Things to speed up common actions, such as creating to-dos with prefilled content or quickly viewing your lists. Adding a to-do to a specific list. Creating a new to-do based on the contents of your clipboard. Creating a travel checklist based on a predefined template. Opening Things and searching for a tag. These features require iOS 12 and Things 3.7 or later. A preset allows you to predefine certain attributes so you don't have to apply them manually every time you enter a similar to-do. 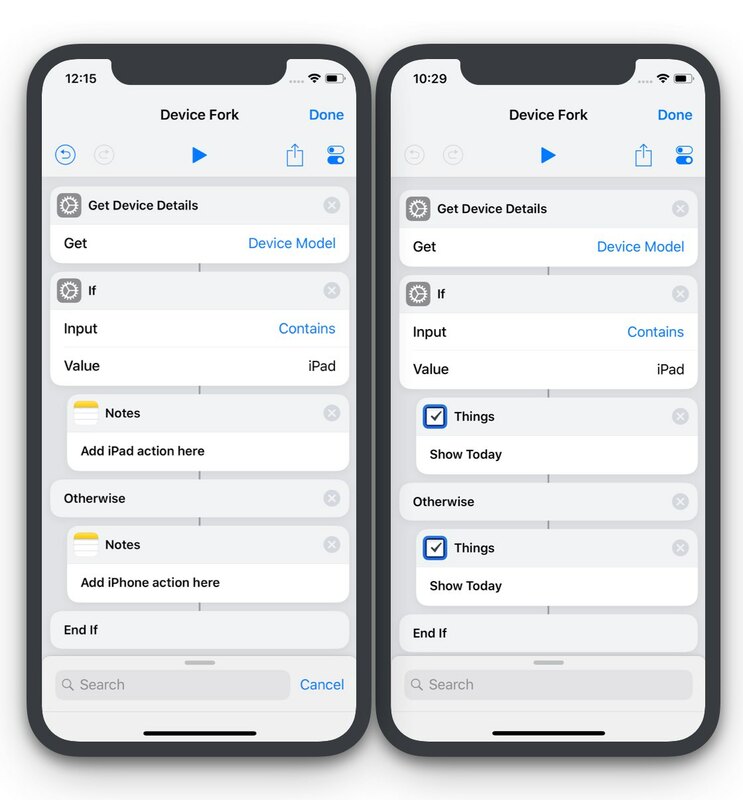 You can create a preset through our own shortcuts builder on iPhone or iPad, and then add a voice command to trigger the action. For example, if you are planning a trip to Japan and research places to visit and things to do, you might want a way to quickly add those ideas to your project. You can create a shortcut which already has your destination preset, as well as a tag so you can quickly filter the list by fun stuff to do. On your iOS device, go to Things > Settings > Siri & Shortcuts. Tap Tags and select the tag you want pre-set for this shortcut. Tap List and select the list where you want the new to-dos to go. Make sure that Edit in Things is turned on – it will allow you to make changes to the to-do before it's saved. Record a voice command, for example: “Japan trip activities”. 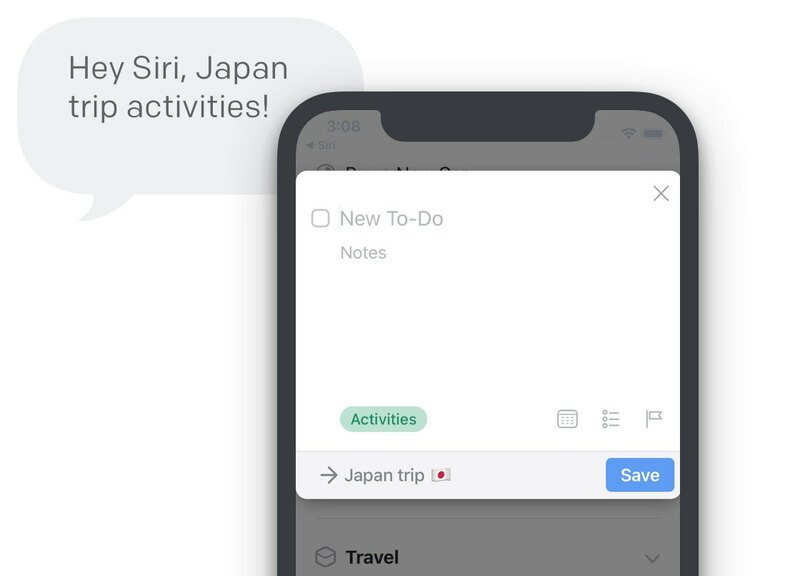 When you say “Hey Siri, Japan trip activities”, Things will open and present you with a new to-do that has its tag and list preset – all you need before saving it is a title. “Hey Siri, today!” – Create a shortcut that already has the Today list preset as the destination. “Hey Siri, finances!” – Create a shortcut that has the Money tag applied and goes straight to your Finances area. Great for when you want to capture any reminders about payments or ideas for savings opportunities. With a ready-made to-do you set up the entire task in advance and then just speak your voice-command to create it. These are great for to-dos that always stay the same. Add a Checklist – each new line equals one checklist entry. Pick a List to add the new to-do to. Record a voice command, for example: “It's travel time”. 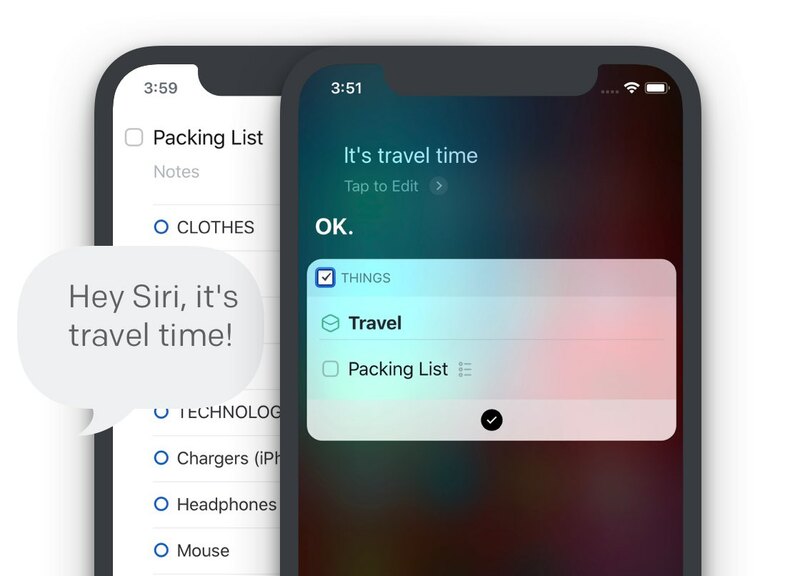 When you say “Hey Siri, it's travel time!”, a new to-do with the title “Packing List” listing all the items you need to bring on your trip will be created in your Travel area. This will all happen in the background without Things opening. “Hey Siri, blog post draft!” – List all the steps you need to run through so you can publish the perfect blog post, from writing the first draft, collecting images and proofreading, to publishing. “Hey Siri, weekly meeting!” – Make sure you don't forget to bring reports, notes, and presentations to the next meeting with your team. “Hey Siri, party time!” – Is the weekend finally here? Then create your party checklist to make sure you have everything to mix your favorite drinks, hunker down with your favorite snacks, and have a great time with your friends. When to-dos come to you from other sources – emails, notes, websites, etc. – you can select the text you want to turn into a to-do and use a preset or ready-made to-do to automatically add it to your new task. Title: the first line will be added as the title, the rest will be added to the notes section. Notes: the entire clipboard content will be added to the notes. Checklist: each line of your text will become its own checklist item. Tap Checklist and enable Paste from Clipboard. Tap List and select a project or area. Make sure that Edit in Things is turned on – it will allow you to make changes to the to-do before it's saved so you can add a title, etc. Record a voice command, for example: “New work list”. Tell Siri: “New work list”. Things will now open with a new to-do. The checklist will already be filled with your text selection and the destination will be your preset area or project. All you still need to do is set a title and save the new task. Tip: Looking for a non-work related use case? If you like to cook and research recipes, a shortcut like this can help you quickly create a shopping list when you select the ingredients on a website and then pass them as a checklist into a new to-do in Things. 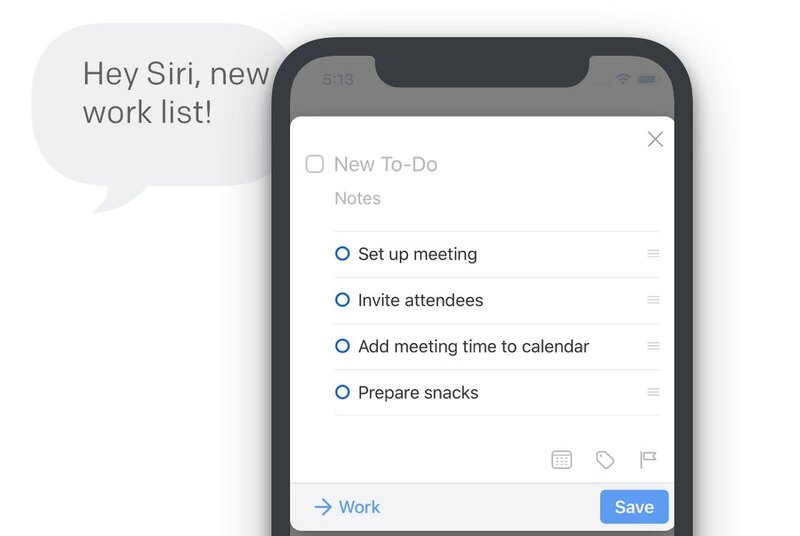 If you find yourself working with a specific list more than others, or if you need to see all the to-dos with a particular tag often, a shortcut can help you access that information with a single voice command. Tap List and enter the name of your tag, for example Phone. Record a voice command, for example: “Show my calls”. 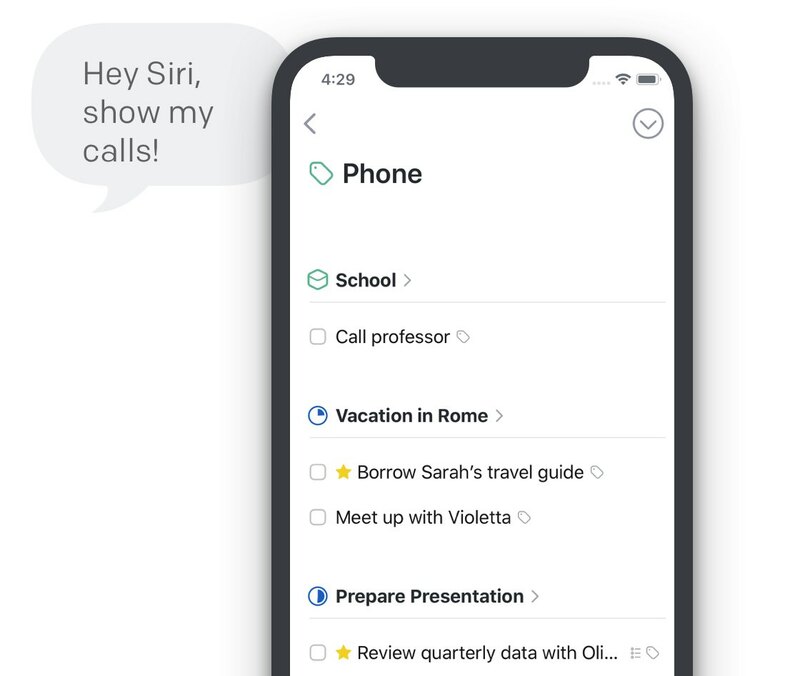 When you now say “Hey Siri, show my calls”, Siri will open Things and search all your to-dos for those that have the Phone tag attached. Make sure you have updated your iPhone and iPad to iOS 12 and Things 3.7. This feature is not available on iOS 10 or iOS 11 or in previous versions of Things. Things for iPhone and iPad are technically two different apps, which means that any Things shortcuts you create on one device won’t work on the other device. You can work around this limitation by using an If statement in Apple’s Shortcuts app. You can then use a single voice command to trigger the same action on both devices.